Published May 22, 2017 By Julia 28 CommentsThis post may contain affiliate links. 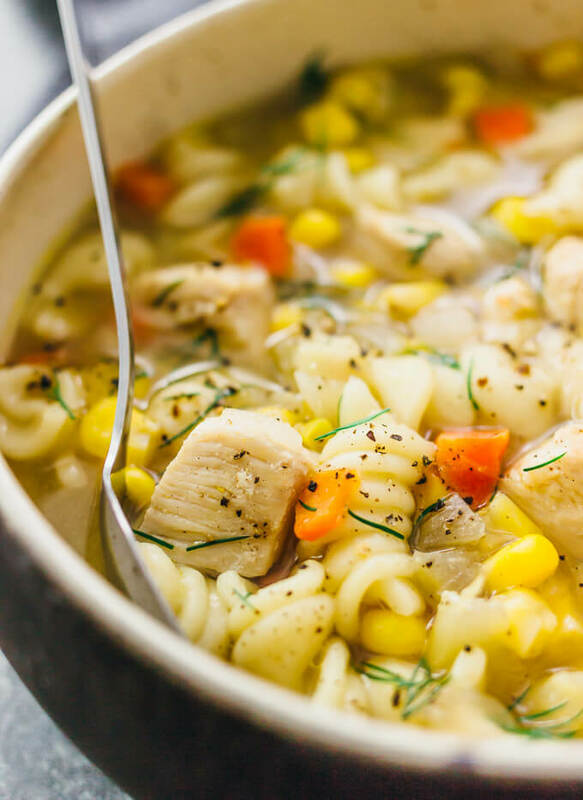 Here’s a fast and easy recipe for Instant Pot chicken noodle soup — healthy, homemade, and from scratch. I love ordering soups from local eateries, such as broccoli cheddar soup, chicken noodle soup, and clam chowder, but my main gripe is that it’s always too salty. Maybe it’s because I’m mainly eating home cooked meals these days and I’m not used to restaurant-levels of salt. Not only is the extra salt in these soups a bit jarring, it’s also bad for anyone trying to maintain their weight, as research shows that salty diets make you hungrier. I’ve come around to making homemade soups instead, starting with creamy potato soups and now this chicken noodle soup. I use low-sodium chicken stock, fresh and unprocessed ingredients, and add salt to taste when serving. This homemade version is a lot healthier, and I find it’s easier to taste all of its flavors when it’s not overloaded with salt. Cooking this chicken noodle soup in the Instant Pot is fast. In just 10 minutes of pressure cooking, you are left with shreddable chunks of chicken and meltingly tender noodles. Everything cooks together in the same pot, including the noodles, and with the Instant Pot you can sauté in the same pot as well. Instant pot artichokes with spicy garlic mustard dip – simplest way to cook artichokes. Instant pot salmon with chili-lime sauce – yields perfectly cooked salmon. Instant pot corned beef and cabbage – much faster than the slow cooked alternative. Instant pot chicken tikka masala – my favorite Indian dish. This chicken noodle soup includes diced onions, celery, and carrots, which means you can significantly simplify your prep work by buying mirepoix (pronounced MEER-pwah). Mirepoix is a ready-to-use package of pre-diced and proportioned amounts of onions, celery, and carrots. It’s available at most supermarkets, and I get mine in a 15 ounce tub that amounts to half an onion, 3 carrots, and 3 celery stalks. This is such a time saver and it’s great to use in soups and stews, especially when I’m making a big pot of shrimp and sausage gumbo. 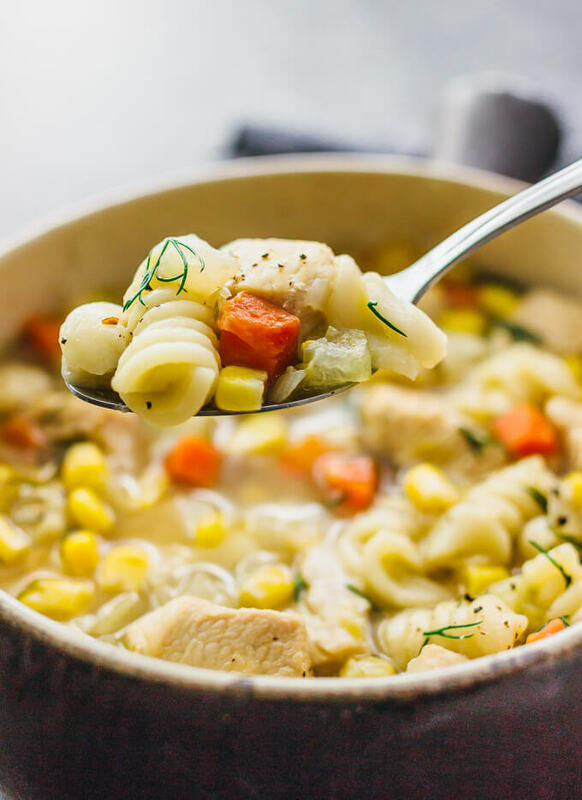 This is a chunky and hearty chicken noodle soup; if you prefer yours with more liquid, you can easily add more chicken stock until it reaches your desired consistency. 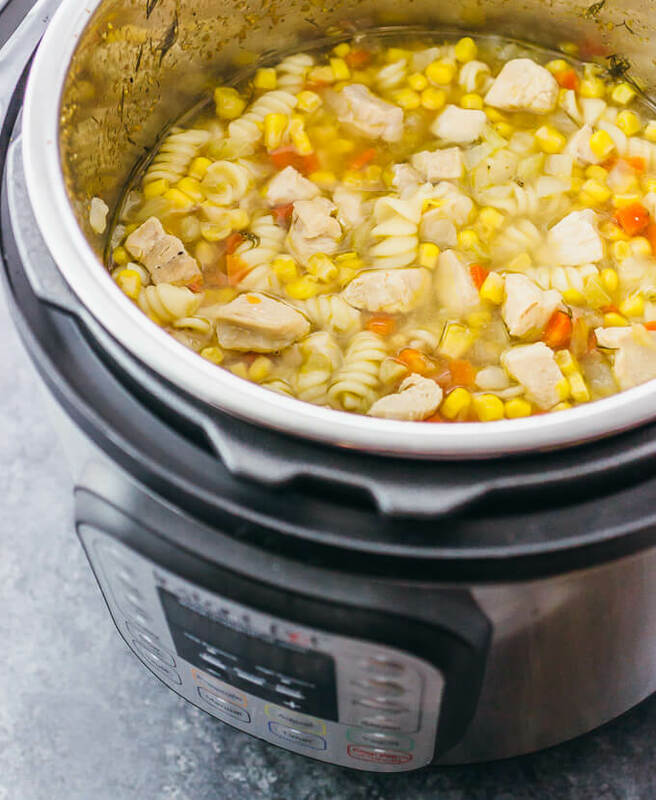 Here's an easy recipe for Instant Pot chicken noodle soup -- healthy, homemade, and from scratch. Set the pressure cooker to the sauté setting on medium heat. Once it reaches temperature, add butter. As it melts, spread it across the bottom of the pot. Add chicken and cook until the outsides of the chicken chunks are mostly cooked, a few minutes, stirring occasionally. Add onions, celery, and carrots, stirring everything together. Cook for a few minutes until fragrant, stirring occasionally. Turn off the sauté setting. Add corn, chicken broth, pasta, dill, and pepper. Stir. Check that all ingredients are submerged in the liquid. Cover and lock the lid on the pressure cooker. Select the manual pressure cooking setting and adjust the cooking time to 10 minutes at high pressure. When the pressure cooker is finished, use the quick release handle to release steam pressure and stop the cooking. Stir the contents, adding salt to taste. Serve warm. This looks so good! If I swapped out the rotini for wide egg noodles, do you think I’d need to adjust the cooking time? I just made this recipe and doubled the ingredients to make enough for 10 people. I turned out delicious! I set the instant pot to 13 minutes but I think 11 would have been perfect. This is absolutely the best chicken noodle soup I have ever made! Tried this tonight to take some to my 90 year old Dad – has a pretty bad cold. We tried it and liked it quite well! Needs a bit a salt at serving. This is such an easy and quick recipe. It’s definitely going in the save file! Thanks! Can you recommend how to adjust the time for a 10 minute natural release mode? I never do instant release anymore due to the violent and unnecessary spraying of steam and liquid that occurs, and most recipes can be adapted to natural release. Without having tested it myself, I would try a 5 minute cook time + 10 minute natural release. Btw, I’m not a fan of the violent steam spraying either, so what I do is I very gently turn the release knob so that it’s a very controlled and slow release. Probably takes a few minutes. I never just turn the knob all the way and let everything spray all over the place. Great recipe – absolutely delicious. 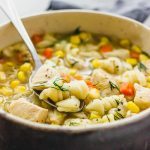 I like this chicken noodle recipe but I don’t have a pressure cooker….what type of pot can I use? I haven’t tested this recipe in anything other than a pressure cooker, unfortunately. You could try making this in a pot on the stovetop, but you’ll likely need to increase the amount of chicken broth because pressure cooking retains more liquid. The cooking time will also need to be increased. I see the “soup” function on the cooker. Have you tried that for making soup? Just wonder if there is any differences? I have not as yet noticed anyone using that function in their recipes. I personally haven’t tried it- still very new to it! I don’t think I’ve tried the “soup” function before. I think that any differences would be minor, and either would work for this recipe. Wonderful soup! I have made it a lot. Followed the recipe exactly. Fantastic! I’m glad to hear it turned out well for you. Just finished cooking and it smells great. I just opened the valve to release the pressure and there is quite a bit of liquid spitting out, more than the normal steam. Any thoughts why it would be doing this? It’s normal to have more steam coming out when you’re cooking a large volume of liquid in the instant pot, such as a soup. Hi, when a liquid is under high pressure, the temperature of it is beyond the boiling point of water, probably close to 250F but the pressure (15 psi) suppresses the actual boil process. When pressure is quickly released in this way, the liquid quickly boils as if you had a vigorous pot of liquid on the stove. The gas in the liquid quickly tries to escape and boils into the vent causing the spouting of liquid. High pressure and high temp is the friend of the instant pot. Do u cook the noodles seperate?? Or do u put in pot? The noodles are cooked in the pot. See recipe where the instructions say to add the rotini pasta. diced raw chicken? or cooked? Thank you! This was a very simple, perfect recipe! I had to use egg noodle because I didn’t want to go to the store, but I don’t think that mattered too much. I appreciate you posting this. Wonderful, I’m glad you liked this! 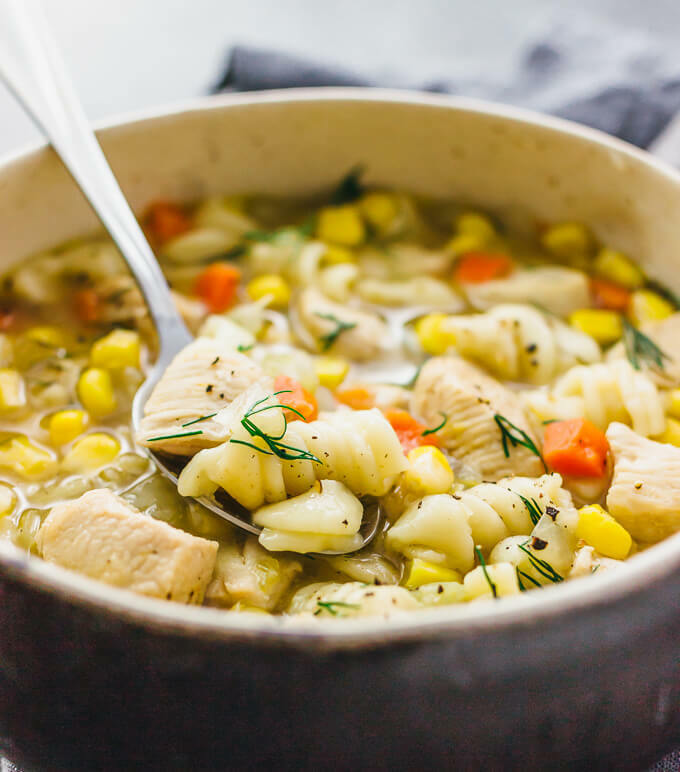 This recipe is Fantastic, I Love Chicken Soup, now it’s made by Me when eat it…. Thanks Kevin, glad you like it! How much is a serving? 2 cups? I am making this right now. Thanks! Yessss- I love finding new instant pot recipes! 1) Becaused delicious, duh. and 2) Because I could totally decide to make them right now and have a meal ready by dinner. Love!